Home→poetry→A place that should have been safe! In a place that should have been safe! In a place that should be safe! What needs to be done to end our “American Holocaust?” What haven’t we tried? 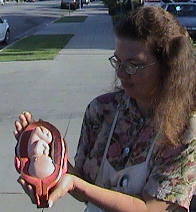 I say, the church as a whole, needs to realize that the baby in the womb is as valuable as you or I! Until the “Body of Christ” values life inside the place that we all should be “safe,” (the church) the unborn will continue to die and eventually, WE ourselves, will not have a place where WE will be safe! Until there are less Christians on the inside of the abortion chamber than on the outside and when our church pews have less silent post-abortive women sitting in them, than our church nursery has babies, then I don’t know if abortion will ever end! Could it be, that we really don’t want “baby killing” to end? Could it be that we “value” money more than life? Could it be, that as we point our finger at society and blame the ungodly, that we really should look in the mirror and realize that we all have a part in the Abortion Holocaust? If God’s word is true and “Children are a gift from God!” Then we need to act like it and repent for not protecting these babies! Isn’t it time for the church to make it a priority to end the American Holocaust? We have been given a new year! This may be our last one! Let’s be the ones to “rescue those being led away to slaughter,” before God has us be the ones who need to be rescued! If that happens, no one will be around to “rescue” us, why? They were aborted! It is time to make LIFE a church priority!